A thoughtful and amusing choice for most elementary comics collections. A witty debut with whip-smart dialogue that will find much love among fans of authors like John Green and Jason Reynolds. A fun secondary purchase to start a back-to-school conversation. Children will enjoy examining the lively and giggle-worthy cartoon art. 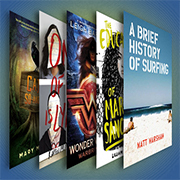 Whether it’s a superhero adventure, a camp experience like no other, a whodunit, a coming-of-age tale, or a short but complete history of surfing, these five choices are just right for summer reading shelves. 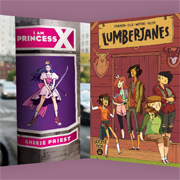 Recommended for older teens interested in sci-fi/fantasy graphic novels with a retro feel. 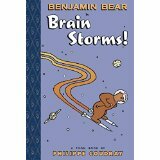 A must-have for early readers who would like to try a graphic novel or comic. From a summer romance to a vicious motorcycle race and a camp that’s just a bit unusual to a mystery that will keep readers guessing until the very end, the following titles are just what teens need to finish off the last weeks of summer. 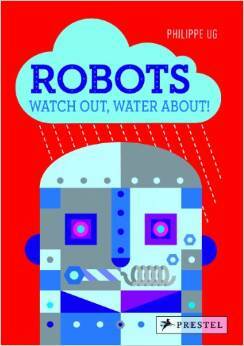 The natural congruency of mechanical robots and a book with moving pieces makes this a solid choice for pop-up collections.